weber_cam: Aubergine, to salt or not to salt? Aubergine, to salt or not to salt? 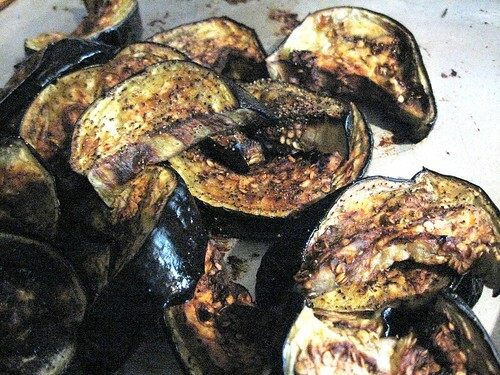 My favorite preparation of eggplant is roasting or grilling thickly-sliced rounds. There are two prominent schools of thought among auberginophiles. Some salt, some do not. Salting, it's touted, is the way to remove bitterness. Not salting is the method of the lazy Philistine who can't tell the bitterness has been removed (me). I am now a salter. Last night was salad night. A bed of greens topped with aldente, fenugreek-laced puy lentils, some Egyptian-style feta on the side and a grilled veggie on top; dress the salad and it's dinner time. Busily speeding around the kitchen the other night, I sliced the eggplant and decided to give salting a try. A heavy brine is the fastest way to brine anything in the shortest time. Don't mean to be arrogant, but I don't need a 30-comment rambling thread on Chowhound to be convinced of the proper method. This is a matter of chemistry. And, I'm right. I immersed the slices in the brine beneath a heavy plate (the brine was made from about 1/2 C salt and a couple cups of water). They stayed submerged about 15 minutes. tossed into a single layer on a sheet pan and roasted for 20 minutes at 400°F/convection, no flipping. WOW! My complaint with not salting and roasting (aside from the oil thing) is the texture - real mushy. The texture this time (and it should've brined longer) was tighter and more dense. It crisped well too because of the even coating of oil. If you're not a salter - go ahead and try it.